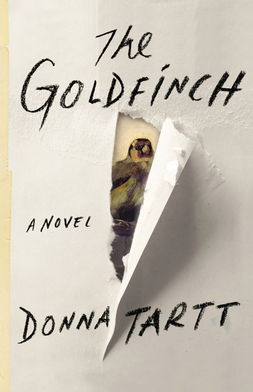 For those of you that have been living under a literary rock, I introduce Donna Tartt's first new novel in 11 years, the Pulitzer-prize winning Goldfinch. Theo Decker, a 13-year-old New Yorker, miraculously survives an accident that kills his mother. Abandoned by his father, Theo is taken in by the family of a wealthy friend [and is] tormented above all by his longing for his mother. He clings to the one thing that reminds him of her: a small, mysteriously captivating painting that ultimately draws Theo into the underworld of art. So first and foremost, this is obviously well-written and a good read. It reminds me of many Pulitzer-prize winning novels in that throughout the lengthy process of reading you continue more because you ought to than because it's a true page-turner or you're deeply drawn in. When I read Orphan Master's Son earlier this year I thought the same- it's a worthwhile endeavor, but there's almost an academic, educational quality that surpasses the simple readability that typically has me reaching for a book. This was like that. I'm glad I read it, even just to experience the true talent Tartt has for creating scenes/characters so vividly (Theo's time in Vegas and his friend Boris stand out as excellent examples of that skill). Her flair for suspense (which is what I loved about A Secret History, probably more than Goldfinch) abounds, but at some points I found the plot a bit tedious. This is an almost-800-page novel about tragic loss, so you have to expect a certain degree of morbidity, but I found it especially bleak and would need 30 minutes and a hug to shake off the weight of the story whenever I put it down. I respect what an ambitious novel it is, and again, it was worth the read, but prepare yourself accordingly. This is a beautifully written review, Meg! Thanks for your honest thoughts. I'll definitely make sure I'm prepared if I do pick it up. Thank you for this review! It frequently pops up when I am looking for a book to read, I just haven't pulled the trigger yet! Now I know if I want to or not!